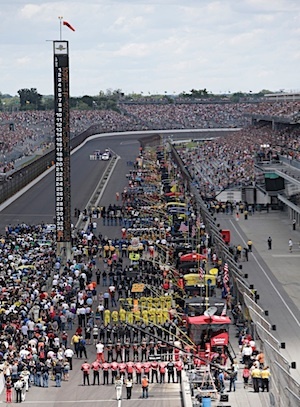 The lead-up to the Brickyard 400 every year starts with a hope: Hope that this 400 will be the one which features action and passing and a move-forward-in-the-chair exciting finish. And each year, the Sprint Cup Series moves on to Pocono or wherever with large numbers of fans and media calling for the Brickyard to be bagged up and left on the curb for disposal. The suspicion here is that this year will be no different. On Sunday, there were the usual long stretches of race when front-runners Jimmie Johnson and eventual winner Ryan Newman were never challenged (between them they led 118 of 160 laps). The race ended with Newman holding a steady multi-second lead over Johnson for, what, the final 25 laps. 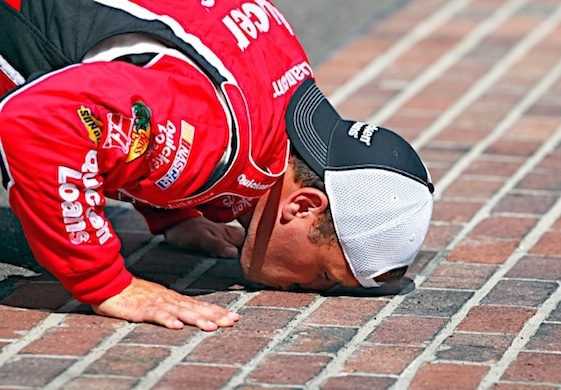 There weren’t even any tire problems or gas mileage concerns to artificially sweeten the 2013 Brickyard. Even Gen 6 and Danica, the two-headed monster of hope, couldn’t save the day. So, horrible event No. 20 at the old Brickyard, right? Especially not right for “racers”: Those who appreciate the sport for more than just wrecks, edgy Tweets, restrictor-plate packs and Miss Sprint. Not right for those who know that stock car racing did not start with Dale Earnhardt and who know that rubbin’ is not racin’ but only one aspect of racing. After Sunday’s race, some reporter in the Indianapolis Motor Speedway press center made the mistake of asking Stewart this: Anything NASCAR or IMS can do to increase passing in these races? It didn’t take long for Stewart’s sparking fuse to reach the powder. Then, he broke is word and said more. “If you want to see passing, we can go out on (highway) 465 and pass all you want,” Stewart continued. “If you can tell me that’s more exciting than what you see at IMS, the great racecar drivers that have competed here. This is about racing. This is about cars being fast. It doesn’t have to be two‑ and three‑wide racing all day long to be good racing. “Racing is about figuring out how to take the package you’re allowed and make it better than what everybody else has and do a better job with it. “I’ve seen races that were won over a lap; I’ve seen 20‑second leads here. For some reason in the last 10 years, everybody is on this kick that you have to be passing all the time. It’s racing, not passing. We’re racing. Stewart’s reaction to the question was similar in tone to that of Michael Schumacher about 10 years ago at IMS when the German champ was asked much the same thing. The Ferrari driver’s response was not nearly as wordy when asked by an American reporter about the lack of passing in Formula 1 races. But it was just as pointed as he simply glared a hole through the head of the question-asker. Maybe therein lies one explanation of why Formula 1 racing keeps expanding – even through seeming disasters like scandal and team revolts – while NASCAR gasps for air over here. Maybe European fans agree that “Racing is about figuring out how to take the package you’re allowed and make it better than what everybody else has and do a better job with it”. Banging doors is cool. Passing is thrilling. Two, three, four V-8s elbowing their way to the checkered flag at 185 rocks. You’ve got to love those things. But you also got to love a lot of the other things. The things which Stewart was talking about. In my hearts eyes, this would be close to 1994 except the fans. I feel leave Grand Am and Nationwide out of this topic (Bad and Badder) and I would like the Brickyard field be 33 like the Indy 500 and out of curiousity, let’s invert the field from 2 to 33 and at Halftime, Lap 80, lets invert the field again from 2 to the Last Car on the Lead Lap Option. If NBC is on the job again, we need something to be happy about! If that mess on Sunday was enjoyable, they should pack up all the cameras and just broadcast it like the radio. I listened to the sound while watching the golf tournament. I didn’t see the bad pit stop (along with most all the fans there). Apparently Johnson didn’t risk the second place or he didn’t care. As to Stewart, he is either assaulting media, or giving “answers” like this. As to Schu didn’t he always start in the rare air on the front row? From the second row back it is hell to pay going into the first turn and surviving the rest of the race. And get this: F1 (and Indy) has invented gimmicks to help cars pass!! !